For most of us the name Ray Harryhausen probably wouldn’t ring a bell. But I’m QUITE sure you’re familiar with some of his work, even if you’re not aware of it. 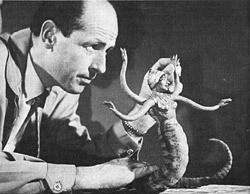 You see, Ray Harryhausen was a groundbreaking visual effects designer, writer, and producer. He created a brand new type of stop-motion animation called Dynamation that allowed you to seamlessly introduce animated creatures into live-action scenes. And Ray was responsible for a heck of a lot of the movie monsters and incredible creatures that you’ve known and loved over the years. Ray died yesterday at the age of 92; And when he shuffled off this mortal coil we lost an incredibly talented…albeit somewhat unknown by the common man…guy. Someone was kind enough to put together a clip of ALL of Ray’s wonderful creatures in chronological order for us. To see a list of the creatures visit The Ray Harryhausen Creatures List website here. Great montage! Holy bongo madness. I love Harryhausen. I’m a little sheepish admitting I didn’t know he was still alive!